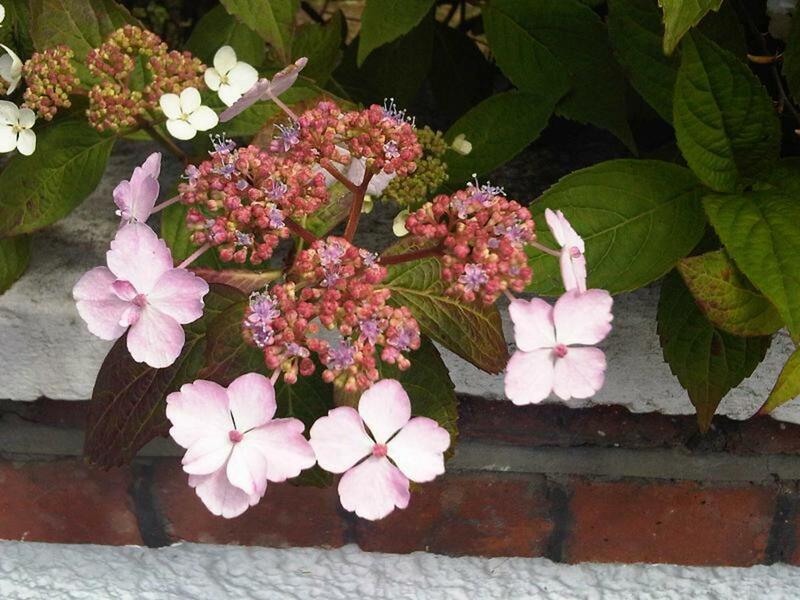 What shrub could be as generous, as beautiful, or as versatile as the hydrangea? A wide growing shrub with big leaves, hydrangeas bloom as early as late June and hold on to their flowers until fall. Mophead, Lacecap, Pee Gee, and Oakleaf hydrangeas offer large blooms of tiny flowers in white, pink, violet, blue, green, and variations in between. 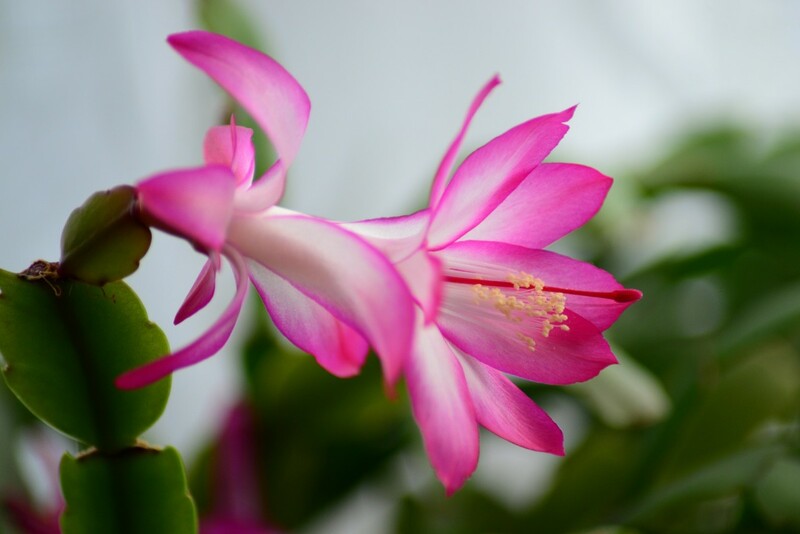 Some blue green flowers show pink at the edges, or pink flowers are touched with violet. Some blue flowers turn greenish or teal toward the end of the season. 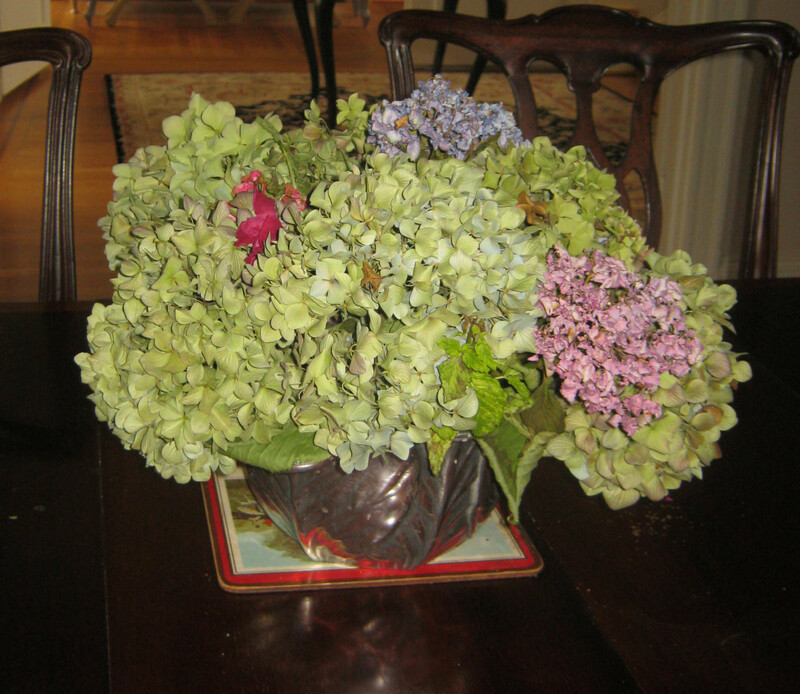 Hydrangeas make fabulous wedding bouquets and floral arrangements. Sometimes, a single stem is all you need. The extravagant nature and large size of hydrangea blooms make them a great choice any time you use cut flowers. Make sure that you cut blooms early in the morning. Hydrangeas dry well. For dried hydrangeas, cut blooms in late summer, when the bloom has naturally dried on the shrub. Unlike most spent blooms, the flowers of the hydrangea age well and retain their beauty long after their peak. 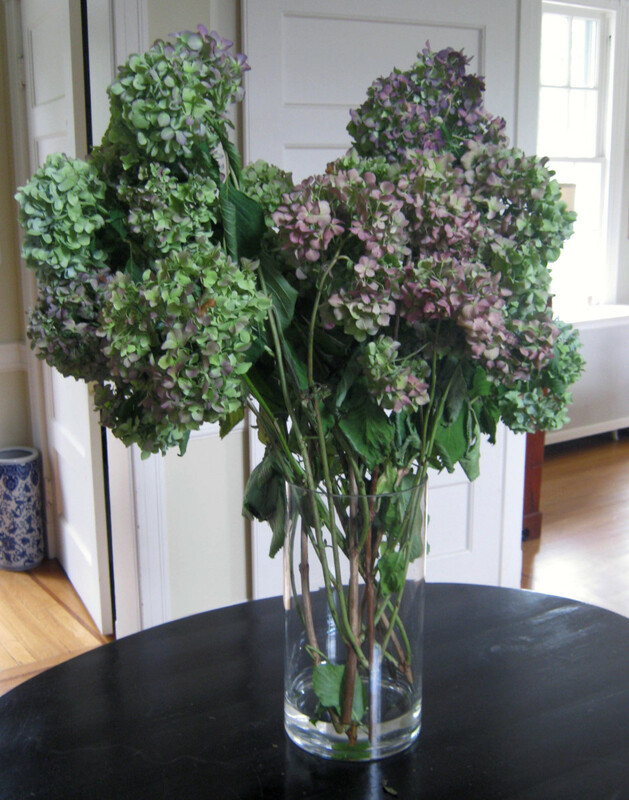 You can hang hydrangeas upside down to dry, or merely place them in a dry vase. 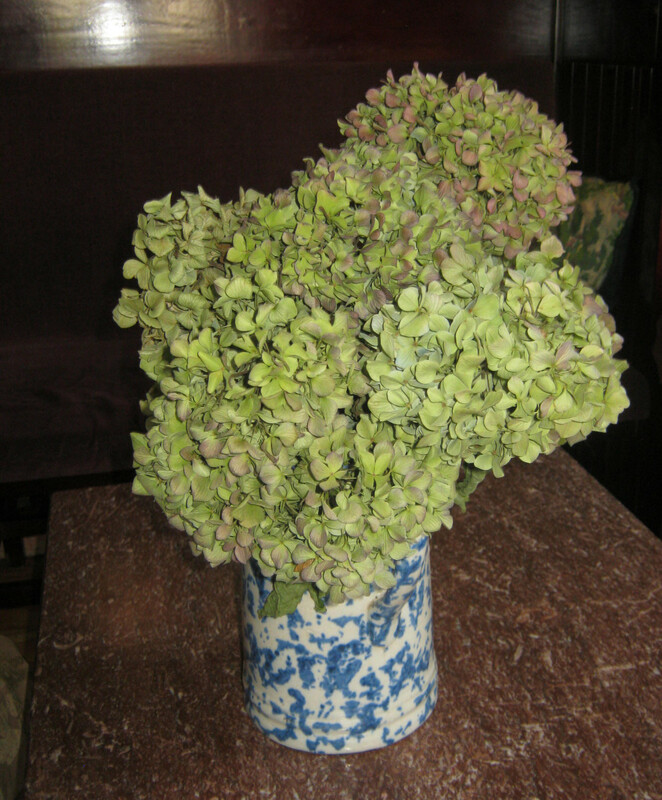 Dried hydrangeas are usually a mix of several colors and their muted hues make for a nice vintage look. Dried hydrangeas are also great for making wreaths. 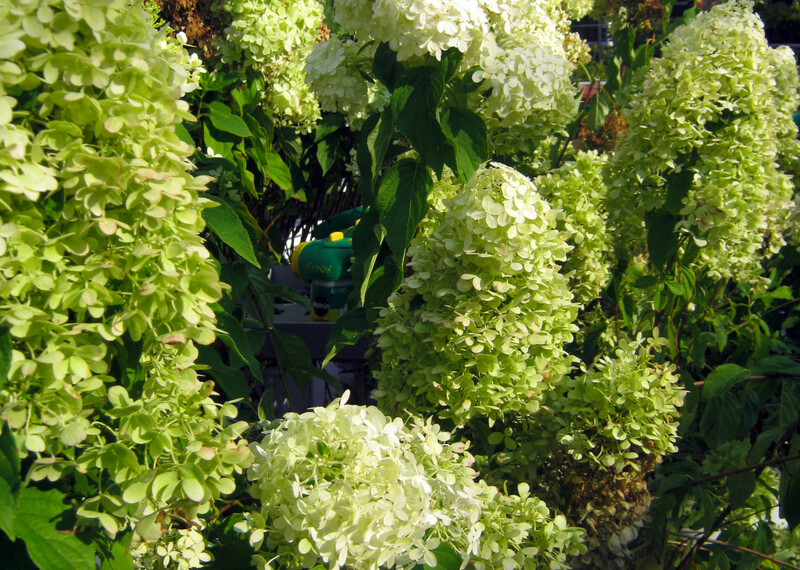 Mophead hydrangeas are the most common form of this popular shrub. A large growing shrub up to 4' tall and as wide or wider, mopheads feature huge, rounded blooms. Mopheads need no pruning, except for the removal of dead or damaged branches. If you want to prune for size, cut back in the summer. Pruning in fall or spring will interfere with bloom production the following year, as new buds are set soon after flowering. 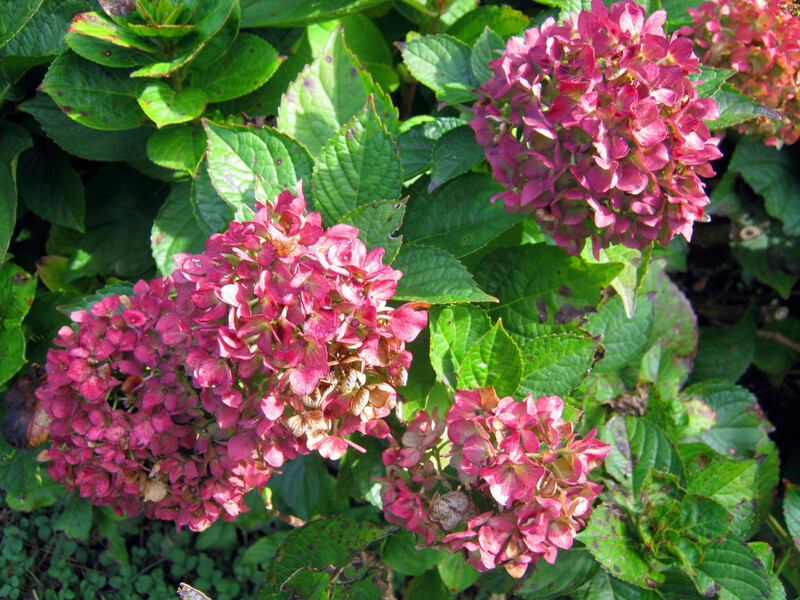 In hotter climates, mophead hydrangeas generally age toward a pinkish green in late summer. 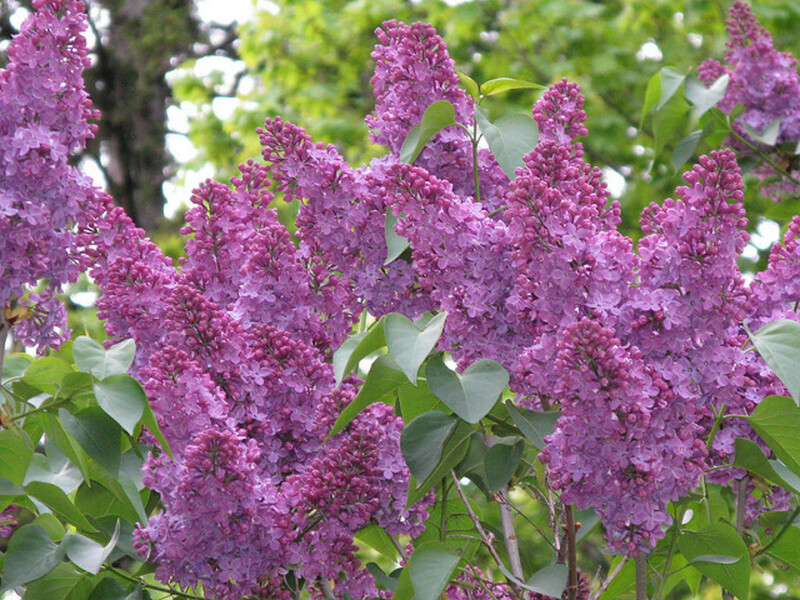 In cooler areas, the blooms fade to a violet or blue. 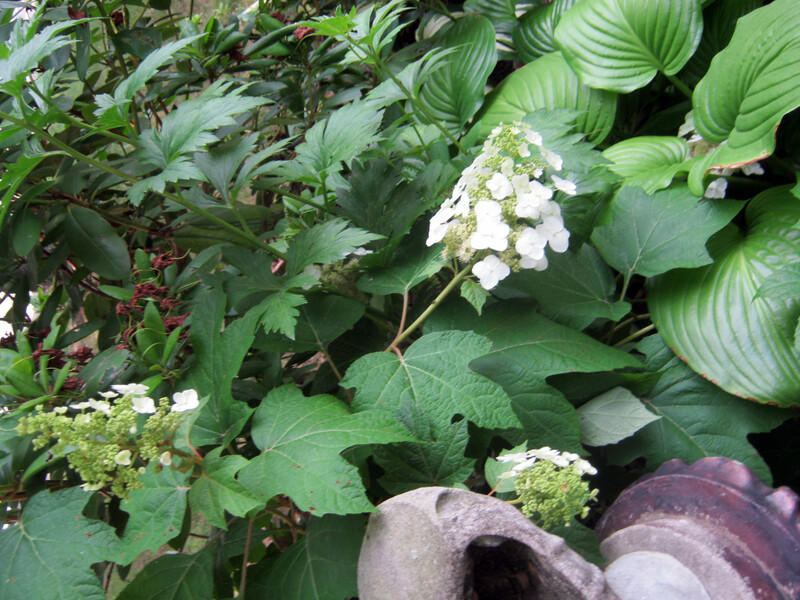 Do not plant mophead hydrangeas under trees as tree roots interfere with water absorption. Heavy, overhanging trees may provide too much shade. Mopheads prefer morning sun and afternoon shade. Pink or blue hydrangeas are influenced by the soil's pH. Use a soil tester kit to determine your soil's pH. Chances are, you know if your soil is acid or alkaline. 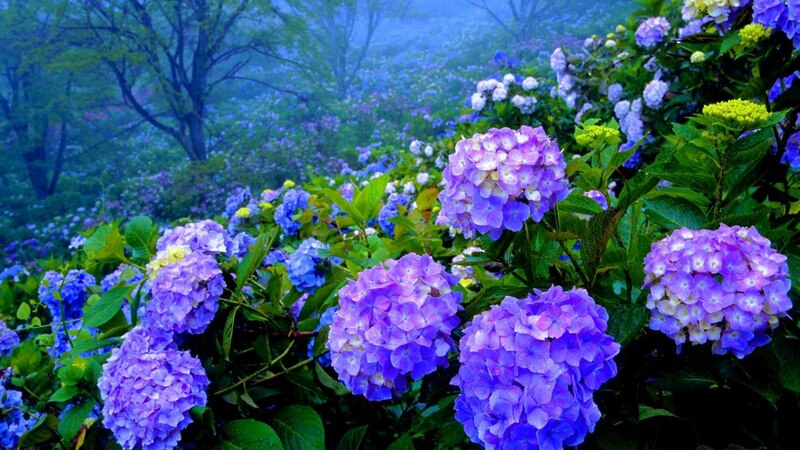 The presence of aluminum in acid soil creates blue hydrangea blooms. 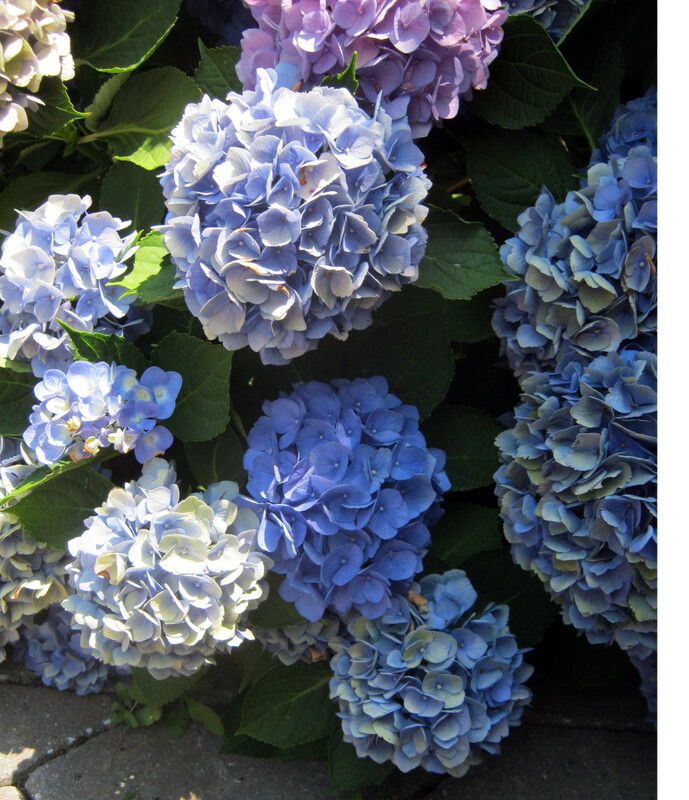 The acid soil (pH 5.2 - 5.5) helps hydrangeas to take up aluminum. Use a fertilizer that is high in potassium and low in phosphorus (25/5/30) if you want blue blooms. You can add Aluminum sulfate by mixing one tablespoon to a gallon of water. For blue blooms, mulch with shredded pine bark, pine needles, or coffee grounds. Nikko Blue is one of the best blue hydrangeas and does well in shade, growing between 4 - 6' tall. It is not unusual to see different colored blooms all on one shrub. Pink hydrangea blossoms are produced with an alkaline soil (pH 6.0 - 6.2). 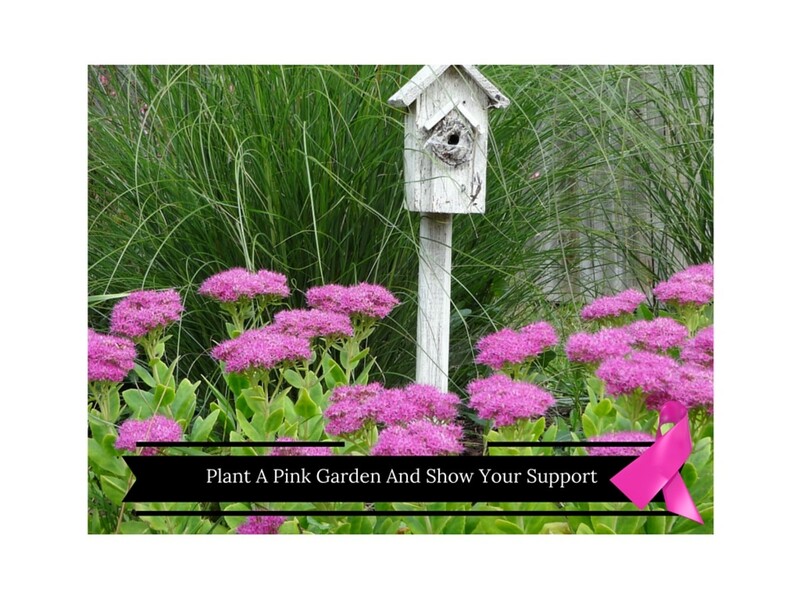 To increase the pink color, add lime to the soil and use a fertilizer that is high in phosphorus (25/10/10). You can increase alkalinity by placing broken pieces of concrete around, not touching, the base of the plant. Or, plant hydrangeas between a cement foundation and sidewalk to enhance the alkalinity of the soil with lime. 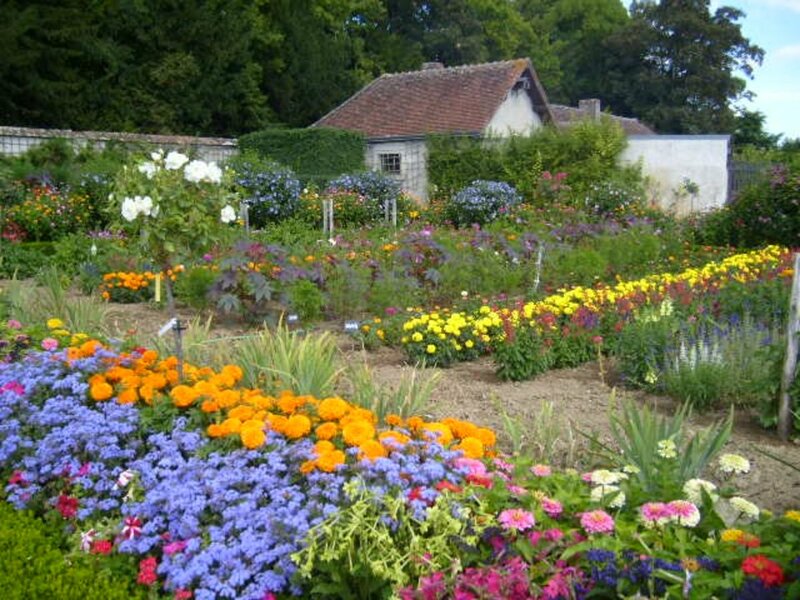 It is easier to intensify the color naturally produced by the soil in your area. 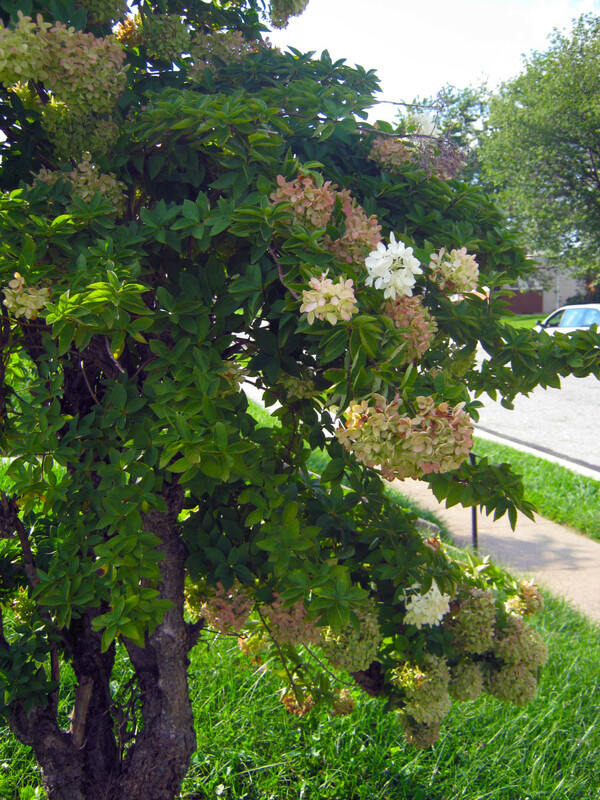 The addition of too many chemicals or too strong of a mixture can harm shrubs. Feed mop-head hydrangeas in late winter or early spring. Add compost and mulch to retain moisture. Newly planted hydrangeas may need watering daily in dry, hot weather. 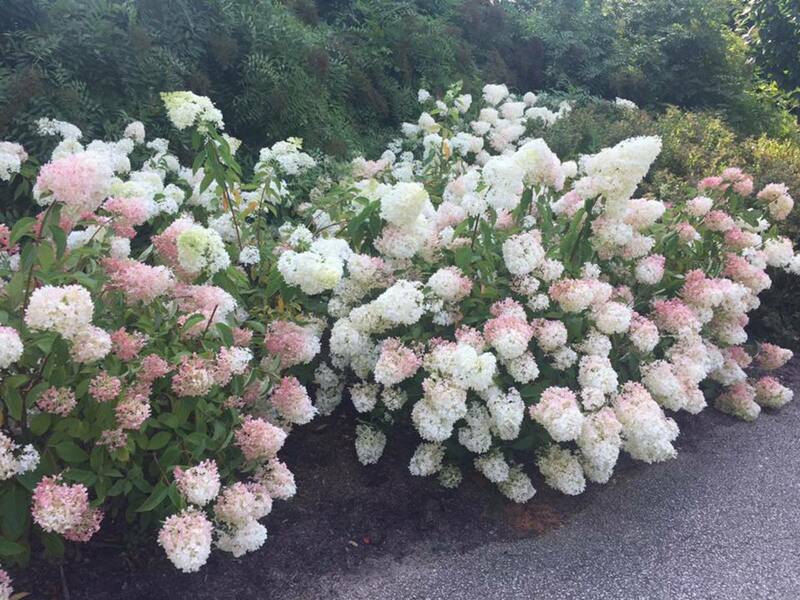 The blooms of white or cream colored hydrangeas can not be altered. The color of lace-caps can be influenced in the same way as mopheads. Lacecap hydrangeas feature flattened, rounded blooms with tiny, tightly packed flowers in the center, encircled by larger flowers typical of mop-heads. Treat lacecaps the same as mopheads. Lacecaps are not as common as mopheads but respond to the same color influences. They grow from 3-5' tall. Pee Gee or Hydrangea paniculata does well in full sun and hot weather. This large growing shrub can be pruned any time of the year into tree shape. White blooms in late summer often turn pink with age. Paniculata grandiflora is a popular variation with huge, white blooms and is the source of the nick name, Pee Gee. Paniculata grows up to 10' tall and is often used as a focal point, due to its old fashioned charm and striking good looks. Oakleaf hydrangeas grow in sun or partial shade but will do better in hot areas with a bit of afternoon shade. Oakleaf hydrangeas require excellent drainage as too much moisture will rot the roots. This US native produces beautiful white blooms and is more suited to to dry weather than mopheads. The blooms are not rounded, but conical spikes of many small flowers. Oakleaf hydrangea gets its name from the leaves which resemble oak leaves and not at all like the standard, heart shaped hydrangea leaf. The foliage turns bronze, red, or purple in fall. Are you supposed to cut back hydrangeas? We have beautiful plant; but no blooms. Generally the lack of blooms on a hydrangea indicate improper pruning. When and how to prune a hydrangea depends on the type of plant that you have. There are many types. Look up information on your specific kind of plant. Some hydrangeas bloom on old wood. These include big leaf and oak leaf. Plants that bloom on old wood usually flower in early summer and form the next year's flowers in late summer and early fall. So prune these in late summer or early fall. Better yet, cut those big, fat gorgeous blooms and put them in a vase! Hydrangeas that bloom on new growth usually flower bloom in late summer. These include panticle and peegee. Prune these in late winter. A good pruning can increase the size of the blooms. Some varieties appreciate a hard prune, but it depends on what type of hydrangea that you have in your garden. Hi Margie - although many garden sites claim that you can grow mop heads in containers, I would not do so. If you do want to keep it in a pot make sure that the hydrangea gets morning sun avoiding the harsh sun of afternoon. The container should be large and have drain holes at the bottom. 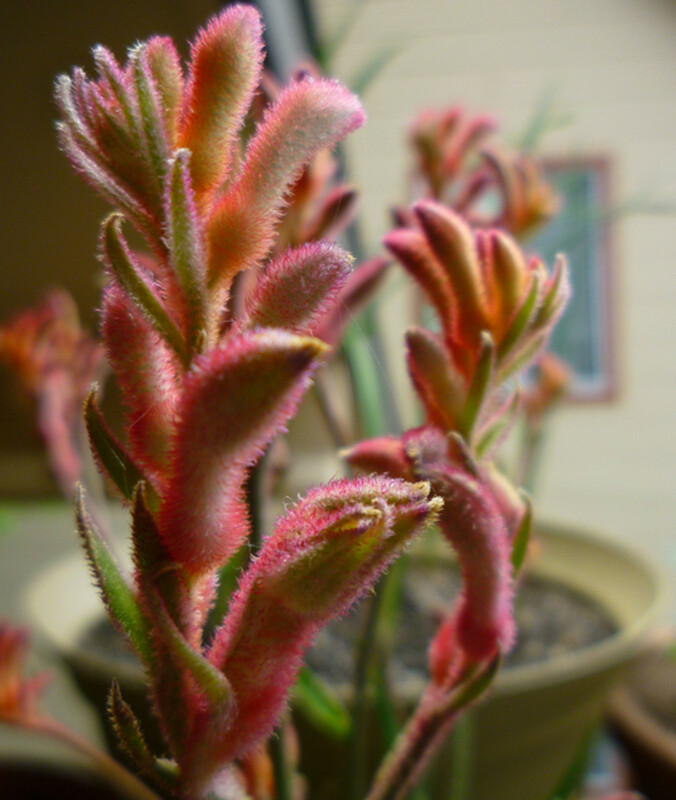 If you received the plant as a gift, if it was grown in a hot house, it may not succeed. These type of plants are forced and grown in controlled climates. Also, if you have very cold winter temperatures, the plant should spend the winter in the ground. Good luck! I have a mop head it is peaking out some green leaves. I have it in a container, but not doing so great! Thanks for the great info! Hi Ben! it's a little early to see buds on a mophead. Mine are just starting teenie little green flower buds and it's been a cool spring. You folks up there in the Great White North, I am sure stuff is later than down here below the Mason Dixon line. Have patience. Give them a little feed to give them a boost. I like Holly Tone. Thanks for stopping in! Hey D, well this is my first spring with hydrangeas and so far no buds that I can tell, the mop head variety. I wasn't sure if I was supposed to bust down the old stems from last year? So I broke one open and it looked green to me, and realized I probably shouldn't mess with it. Still waiting for either to kick in...other plants haven't started here yet too, like my mulberry and others. Glad I reread your article here, I never realized all the variety in this species.